Yes, I give advice here. I find things that have worked for me (or for others) and am glad to share them. Sometimes I find quotes and/or Biblical verses that inspire, correct, guide or admonish you. The advice is: You make your own life!! That’s it – ultimately you make your own decisions and you make your own life. Your parents may direct you when you are younger – either overtly or subtly. They might say ‘Go into this major field’ (overt) or ‘I think this major field would be a good choice’ (or even ‘this major field was great for my friend <name>’). That is advice – we can act on the advice – or we can ignore the advice – or we can incorporate some of the advice into our lives. As you get married your spouse may give advice. And again this can be overt or subtle. Things like “Dear, it would be great is you <did this advice>”; or the subtle “I see <name> did great in <this area / major / advice>.” (which implies it would be good for you. BUT – you are not like somebody else. In High School, a distance cousin was head-and-shoulders over me in terms of grades. In college I was way ahead of him in terms of grades. From high school (where honestly, I didn’t really care) to college (where I was in charge of my life), things really switched around. Three days ago, I attended a five-and-six year old soccer game where my granddaughters played. One of the granddaughters did pretty much what she was directed to do by the coach and by her mother / grandmother. The other one did pretty much what she wanted to do – ignored the coach, didn’t do a great job on the field. Mom and grandma urged the second girl to play harder, to go to the ball, to kick it towards the goal – but she did her own thing. If one was to guess from age five, she will never play in the Olympics on the women’s soccer team. Is that bad? Could and should she be learned about teamwork, paying attention to a coach, and doing some good actions? Absolutely. But, maybe at age five she had made an internal decision that soccer isn’t ‘her thing’. How about you? Are you following somebody else’s advice? Not that advice is bad, but you do make your own life. You can incorporate some advice about how to get promoted and how to make more money (if that is your goal) or how to have a better marriage – or you can ignore the advice – your choice. In some families, the son takes after the father. If the grandfather / father were lawyers, the son is expected to be a lawyer as well. But, what if the son doesn’t want to be a lawyer but a salesman? You make your own life. So what do you think? Are you making your own life or is somebody’s advice holding you back? Is that important to you? Yesterday I did my weekly mentoring session. I’m a mentor for a 6th grade student at the nearby Middle School. His mother requested a mentor for him. Seemingly his father is out of the picture (divorced probably) and she thought an adult male role model would be good for him. It isn’t a hard assignment. We spend about an hour together once a week. I have done some structured activities (moebius strips, wuzzles, logic problems), some games (connect four, Apples to Apples, Yahtzee), and some physical things (he loved to shoot baskets). We talk a little. Sometimes I try to get some life lessons and suggestions, but I try not to be too philosophical. Last week I learned that he and his family are moving to Washington State. Something about more of his mother’s family are there and it might be a new start for them. Subconsciously I think I will miss him – although we will have about six more times together. I’m getting to know him and becoming comfortable with him and he with me. Although he didn’t tell me (the middle school program coordinator did), he misses his real father. As a man who grew up in a solid nuclear family home – and only one person in terms of fairly closely related ever divorced, the idea of a split family is not as close as it must be to this young man. Maybe he will get the idea that if marriage doesn’t work out, you just call it quits and move on. As a mentor, I can communicate verbally and non-verbally. He can see me as a caring adult (or caring ‘foster grandparent’). My actions of just showing up every week should tell him that I think he is important and has value in my life (and that I care about him). To have an adult that is not a parent spend an hour with any sixth grader one-on-one is almost unheard of. Thinking of myself – do I have anybody who spends an hour with me one-on-one other than my wife or a relative? Maybe we all need mentors to be role models for us, to listen to us, and just to show up on a regular basis. Such mentors directly or indirectly say “You are important to me”. I had many mentors in my life – mostly teachers who cared to talk to me one-on-one, to be around and to be role models. They gave of themselves – and now it is time for me to give back to others. So what do you think? Is such giving back as a mentor important to you? Can you think of how some of your mentors have helped you through life? Shaunti Feldhahn has these two thought, that I am borrowing today. When I was a professor, I had a community. I didn’t need to build it, the student, administration, professors, and all built it for me. When I walked into a class on the first day, the community was there. The students had registered for my class section. Some had picked my section because the time was right for them; some had looked at various reviews that suggested I was a fair and honest professor; others had talked to their friends who had taken my class before and strongly endorsed my class / section. I had other communities. In Hamden, I had two (three?) symphony orchestras for communities: Hamden Symphony, Cheshire Symphony (and on occasion Quinnipiac University Symphony). I had the Pep Band community; the Sig Ep community; the St. Rita community. In Leander, my communities are less with my retirement. The university community is smaller as I only see those that have befriended me on Facebook. I’m kind of leaving the Band of the Hills community; I like the Brushy Creek Brass Band group – but that is a sporadic community for May and October. I have a men’s group through Gateway Church that is a community and another at St. Vincent de Paul church. I’m in a Stephen Ministry community. I’m in the Vista Ridge HOA community. Not quite the same involvement as my Hamden Communities. I’ve been in a lot of online communities. Facebook is one community that I appreciate – with college friends (both from my attendance and my teaching); and more. I was in a great Twitter community with transgender friends until that caused angst in my family. I know I need to cultivate a new and larger community. I can do that be stretching my neck out – being more open than I have been in the past year. Going along with the first suggestion (build a community) is being able to ask for help. If I do leave the Band of the Hills, is there a music community that I can join (or start)? Is there a work community? More interaction with the Leander Middle School people? Go to games and events? Get to know more of the faculty and students. I’ve asked our daughter for help and am planning on attending a BSF group tonight for a new community. Let’s see if that can blossom into more friends and a close environment. So how about you? Are you reaching out and building or joining communities? Are you insecure? Do you think you are less than others? I know that sometimes I am too worried about what other might think of me. I know I try not to judge – but know that others might be more into judging me that I am of them. I have to accept who I am. No more (and be overly proud) or too less (and be insecure). But this quote states that God is with me – as a best friend that stands beside me. “No, in all these things we are more than conquerors through him who loved us. For I am convinced that neither death nor life, neither angels nor demons, neither the present nor the future, nor any powers, neither height nor depth, nor anything else in all creation, will be able to separate us from the love of God that is in Christ Jesus our Lord. If I take that as true, then I am something – in God – I am more than a conqueror. Whatever somebody else says, they don’t recognize that I am under God’s umbrella. Maybe I’m not as fast or smart or good looking or <whatever> than another person, but that’s okay. I am who I am – and frail and failing as I am, I’m able to say that God is for me – so who cares what else is going on – God is WITH me!!! And … nothing can separate me from God. So, how is your insecurity? Can you put yourself under God’s protection? Eat nutritious – not junk food, not sugar laden sodas or nutrition-less white bread / white flour. Eat your vegetables; avoid needless carbohydrates. Enjoy Life – all of the previous list is pointing to being happy in yourself. Take time to enjoy life – taking time to ‘Smell the Roses”. How about you – are you enjoying life? How might you rate yourself on the previous list? Life is too short – make the most of it!! Okay, I like playing April Fool Day jokes. When I was teaching I would wear my cap and gown and proclaim that it was “Academic Apparel Day”. People would say “Gee, I hadn’t heard that” or similar comments. Eventually they would reason – “Ah, crazy Bruce, it is April Fool’s Day”. Yesterday was a little less involved, just a new profile picture on Facebook. So, yes, it is my head on an Indiana Jones body!! (plus some additional features). Thanks Charles Rice!!! A while back I had a post on laughter. April Fool’s Day is a great day for laughter. It was also Easter – which is a solemn occasion but also a happy day. Having a laugh trying to picture Bruce White as Harrison Ford playing Indiana Jones – that definitely is a laughable situation. There is a time for everything,and a season for every activity under the heavens: a time to be born and a time to die, a time to plant and a time to uproot, a time to kill and a time to heal, a time to tear down and a time to build, a time to weep and a time to laugh, a time to mourn and a time to dance, a time to scatter stones and a time to gather them, a time to embrace and a time to refrain from embracing, a time to search and a time to give up, a time to keep and a time to throw away, a time to tear and a time to mend, a time to be silent and a time to speak, a time to love and a time to hate, a time for war and a time for peace. So, yes, there is a time to laugh – and April Fool’s Day might be a good day to laugh!!! So hopefully you had time for a laugh – and you are better for it!! While I hate to step on anyone else’s beliefs, in my life, today is Easter (or Easter Sunday). First a lame joke. Q: Why am I so tired on April 1st? A: After a ‘march’ of 31 days anybody would be tired! In the vast world of the universe, I know so little. Where did the universe come from? Has it always been here? In my limited human understanding, how can something come from nothing? If there were methane clouds that swirled around and interacted – where and how did those clouds occur? Wouldn’t something have been done to ‘create’ them? I see a world of creation. I have children and grandchildren- they are created beings – sperm and egg uniting to make a child. I look at trees – they are created – a seed sprouted and grew. Houses, roads, buildings are created; even ideas are created. So … beyond myself – how can a world that didn’t exist one second and did the next happen? I have no answers so I accept (probably blindly) the concept of GOD. “In the beginning God created the heavens and the earth” comes from the Judeo-Christian scriptures (Genesis 1:1). I have to accept that somehow God is outside my understanding – outside of time; outside of creation. How can such a incomprehensible force that can create the universe bend so low to like and even to ‘love’ me? The concept that ‘he’ knows the number of hairs on my head or ‘knows’ the number of grains of sand on the beaches – can be beyond me. The Christian viewpoint is that ‘God’ created our world – Earth – and populated it with two people (probably more) – an Adam and an Eve. And … on their own, they somehow managed to do something that they were told not to do (the concept of ‘sin’). The extended version is that ‘God’ was unhappy with the two people sinning and wanted to have a relationship with his creation (again if ‘he’ created billions of worlds and stars and planets and things – why could / would ‘he’ want a relationship with ‘me’? There are estimates of the world population of 7.6 billion – or 7,600,000,000 people and I am 1/7,600,000,000 of the world’s population. So, I blindly (with reason) accept that ‘God’ loves me; wants to have a relationship with me (us) – and that to establish that relationship, He / Himself came to us as a child in Bethlehem Israel about 2000 years ago. He / Himself manifests Himself is three ways – beyond the concept of time and space – as created / supreme being; as redeemer – changing to a man to build that relationship; and as guide – spirit to be with us. So, on this Easter, I marvel at the thought that ‘God’ loves me so very much that he wants me to follow him. I don’t understand – but I accept it – and want to live my life accordingly. In the Christian Bible there is a statement that God’s ways are not our ways. While I can’t ever truly comprehend ‘God’ I can fully agree that ‘God’ is a billion (not true – infinitely) bigger than we are – and I need to turn to what he is offering us for free – His love and perfect forgiveness and life-eternal. I’m in a class currently learning to be a caregiver for elderly (and/or others) in a program called “Stephen Ministry”. We are to be able to listen, to hear our care receiver’s complaints, comments and other. I can imagine being with a widower who is depressed and empty after his wife’s death. I can imagine that is a significant shock for either man or woman after a long marriage. (By-the-way, my wife and I will celebrate 44 years of marriage this year). I know that aging isn’t always clean and nice. I’ve seen my parents go from independent home owners, to an apartment to assisted living and then with my father dying and eventually my mother going on hospice care and dying as well. I’ve seen my wife’ parents with my father-in-law having more infernities and pain. He lost weight to about 60% of his regular weight (and he wasn’t heavy anyway). I’ve seen my mother-in-law with dementia / Alzheimer’s – not recognizing her family and eventually dying. So, as my training to be a caregiver is coming to a close, I’m anticipating I may be assigned to a widower lamenting the lost of his wife. In this class we talked about making conversation with our care receiver, with being compassionate, understanding, patient. We are not to solve their problems but to be a friend to listen to them. We also talked about depression – and suicide. I learned that one of the groups that considers suicide frequently is white, senior males. Even with spouses or without spouses, men in that group can view their lives as having no value: they are retired – no jobs, no hobbies, nothing to do most day but watch television or be on the computers. These are tough questions and issues. As a senior white male, I can see some of these issues even with myself. I have no hobbies, I don’t want to ‘give up’ – and try to keep positive. It seems interesting as I might get paired up with somebody similar and I’m to help them be positive – but that should be a good thing – and I will have purpose, meaning and value to them (and to me)!! Today is Good Friday, tomorrow is Passover, Sunday is Easter – for many of my friends these are significant holy days. Good Friday for Christians – remembering that Jesus, the second person of the Trinity, went willingly to a cross and death for all people. Easter for Christians – where Jesus is resurrected from the dead. Even for non religious folks, this is about the time that spring really comes (in the Northern Hemisphere) – and there is new life. There are many philosophies going on here – from light belief to overwhelming belief. I won’t go into it here (wait until Easter), but ‘new life’ is a significant part of life. We CAN CHANGE – we can become NEW people as we change our lives and our thoughts. If we believe in ourselves (and probably in a supreme being), we can change to be positive winners, not doubtful whiners. We tend to be outside in oriented. Let’s say we are talking with a new person in the community at a dinner. We tend to start with “What do you do?”. Then maybe after a few minutes of understanding that, we move to “How do you do it?”. But rarely (if ever) will we get to “Why do you do it?”. But the WHY is really the vital thing – our purpose – what do we believe. The Baldridge National Excellence program frequently looks at MVV – Mission, Vision and Values – basically the WHY of an organization or business. Back to belief systems first. What do you believe? Do you believe that ‘man is basically’ good? If so you will act on life that way. If you on the other hand believe that ‘man is basically bad’ – you will approach things differently. I great up in what was called the “Judeo-Christian” viewpoint – God loves us, He wants us to love Him. Taking that a step farther – WHY is that important to me? That Jesus came as the second person of the Trinity (extending the Jewish understanding) to write that code on our hearts. And … that God wants us to be in fellowship with Him; to love Him; but to love all around us. So my WHY is that I LOVE GOD – and because of that, I need to love others and to show them the way. My WHY is so very deeply inside me – LOVE, FORGIVE, DON’T JUDGE, SHOW MERCY, BE HUMBLE (Micah 6:8 – What does God want from us? To act justly, love mercy and walk humbly with out God”). Starting with WHY, I can branch out to the HOW – so how do I love, forgive, etc.? How do I show mercy? How do I act justly? How can I be humble? Tough questions. 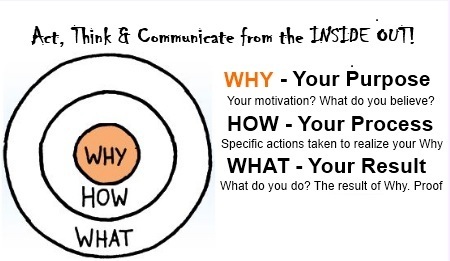 THen the WHAT – what do I do – based upon the WHY and the HOW.